Shares of the cloud-based security specialist moved higher as the company announced a number of new initiatives in its annual customer conference. Shares of Okta, Inc. (NASDAQ:OKTA) were flying higher again last month as the cloud-based identity specialist held its annual Oktane customer conference and forged new partnerships with Facebook and VMware. Investors also were looking forward to the company's first-quarter earnings report in the beginning of June. According to data from S&P Global Market Intelligence, the stock finished May up 31%. As the chart below shows, the gains came mostly during the first and last weeks of the month. There was no single news item driving Okta shares higher last month. Rather, it was a combination of factors, as enthusiasm continues to build for cloud stocks like Okta as their growth opportunities become clearer. There didn't seem to be a clear reason for the company's gains in the first week of May, but toward the end of the month, the company announced a number of new initiatives in the wake of the Oktane conference. These included a partnership and integration with VMware that allowed customers to more securely move to the cloud, a partnership with Workplace by Facebook to an enterprise collaboration, and a release of several new products including ThreatInsight, which can allow companies to replace passwords with stronger authentication techniques. As the company revealed new products and partnerships at Oktane, the stock rose 16% in the last six sessions of the year. 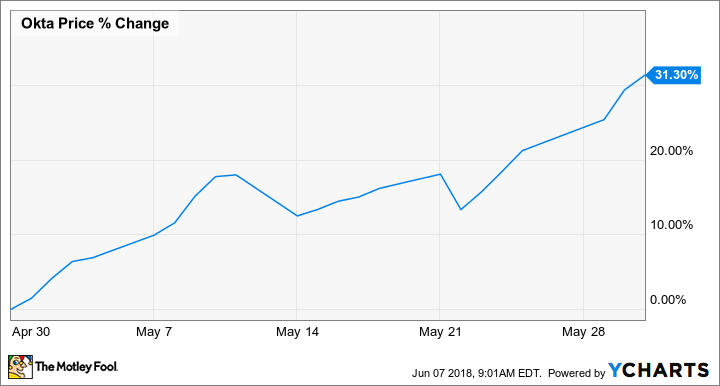 Okta's May surge was justified after the company delivered strong numbers in its first-quarter earnings report on June 6. The cloud specialist surged past its own guidance as revenue jumped 60%, to $83.6 million, and its adjusted loss per share narrowed to $0.09. Both of those numbers topped analyst estimates, and the company raised its guidance for the full year, calling for revenue growth of 38% to 39%. Though Okta still expects an adjusted per share loss of $0.58 to $0.54, it's clear the company is moving in the right direction. Don't be surprised to see Okta stock continue to rise as the company establishes itself as the leader in cloud-based identity and security.